Our home was completely water-proof within 3 weeks after the floor slab was finished. I just replaced the windows and outside doors in my 20 year house with A rated ones. The difference is incredible, no drafts, no outside noise, not to mention no heat loss. I am delighted. I saved €1350 buying my set of house plans from Elite House Plans. (www.elitehouseplans. Floor plans are available for 2 bedroom, 3 bedroom, 4 bedroom and 5 bedroom houses. Floor plans are also available for garages and outhouses. Plans are available in PDF format, by hard copy or in CAD format. Xplan house plans are amazing value for money. Most Planning Authorities have a planning guidelines and/or check list document with the relevant information detailed to aid you (or your agent) to lodge a valid planning application. It will take approximately 1 week for your planning application to be validated, otherwise you must re-submit the application again (with the necessary changes). Once validated, anyone can make an observation (commonly referred to as an objection), within 5 weeks from the date the Planning Authority received the application (excluding Bank Holidays). The fee is at present €20.00. After the 5 weeks have elapsed, the Planning Authority, may seek Further Information. This may take the form of clarification of the information submitted, a request for more details or drawings, an amendment to the plans or some other request for information.You generally have 6 months to supply this information. The Planning Authority on receipt of the Further Information, may seek Clarification of the Further Information. Subject to 4 and 5 above, the Planning Authority, will make a decision, within 8 weeks of the receipt of the Planning Application. This may be a grant of permission (subject to conditions) or a refusal for permission. However the Planning Authority may inform you that they recommend a refusal and offer you a Time Extension. This will give the opportunity to further amend the proposal during the allocated time extension. Subject to no appeal, as stated in 8 or 9 above, you will receive your Final Grant of Permission, 1 month from the date of the decision of the Planning Authority. 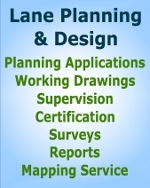 A useful resource for all building and planning issues.